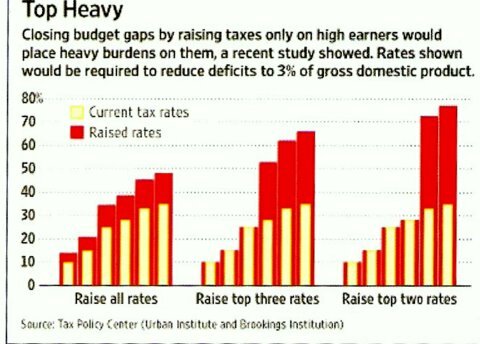 The above graph shows the government would have to tax people with incomes in the current two highest tax brackets well past the 70% rate to reduce the deficit to 3% of GDP. This is based on a static analysis which does not take into account human incentives like successful people protecting their life savings & incomes from confiscation by bureaucrats. In the real world of dynamic analysis the high earners & wealthy (there is a difference) legally protect their incomes & wealth from taxation. This of course always leaves the middle class to pay for the government bills for the programs politicians promised would be paid for by the wealthy, but weren't, thereby leaving the middle class that much poorer. And this in turn promotes more class warfare as the real culprit - politicians go blameless. BO's Debt Reduction Commission was purposely designed to report their findings one month after the November 2 election & their findings have so far thankfully been totally ignored - just another waste of time & money - only our two most precious commodities. The Debt Reduction Commission recommends one dollar of spending cuts for every two dollars of tax increases (raise gasoline taxes by 15 cents, raise the capital gains & dividends tax rates, & raise the cap on Social Security payroll taxes are some examples) - we have all seen where these type of recommendations end so I won't bring up their recommendations again if no one else does either. This leads to the current tax & spending deal negotiated by BO & the detestable establishment Republican leaders such as Mitch McConnell that only serves to set up BO's reelection victory in 2012 - hard to believe but BO is the favorite especially after this deal was certified by the House after it passed the Senate earlier. The WSJ describes the deal (that extends the "Bush tax cuts" for everyone, reinstates the lapsed extended unemployment benefits for 13 months, reinstates the estate tax but @ higher limits & lower rates than those in 2009, & reduces the employee payroll tax 2% for one year) - "this spares the economy from immediate tax harm...but (it) is nothing close to a genuine pro growth supply side tax policy." NJ Congressman Scott Garrett says "ultimately, the bill does not provide the certainty that businesses need" & IN Congressman Mike Pence explains why Garrett is right when he says "uncertainty is the enemy of prosperity...what businessman would take out a five year loan with a two year tax structure in place" & I add "& a President who despises the parts of the deal that don't raise the highest tax rates." Since the current tax rate levels have been in effect during the last two years of recession how does merely extending these rates provide a stimulus to the economy that we don't have in place right now? - The longer people are out of work the more they atrophy losing skills that would make them even less employable in the future thereby making them more likely to become permanent wards of the state - just the type of voter BO prefers. The latest proposed extension of jobless benefits amounts to a cost of $56 billion which merely redistributes income to Americans who already pay no income tax. - BO addressed Forsyth Technical Community College in NC last week. The students applauded the mention of unemployment benefit extensions & booed tax rate cuts "for the wealthy" - who do these students think provide the jobs for their positions when they graduate? But these students & most of the young are brainwashed by BO's presentations & certainly are in his likely voter camp. - Any business plan is longer than two years - one year from now businesses will be @ the same point they are today, namely wondering about the end of their foreseeable tax rate structure so they are not likely to spend capital expanding or hiring thereby making BO's rhetoric that the extension of the "Bush tax cuts" did not work that much more attractive to economic illiterates who will be ready for more government stimulus. The deal does move investment forward into 2011 & 2012 through an accelerated business expense write-off provision thereby making "BO's economy" over the next two years look better than it really would be but with a subsequent slow down in 2013 after he is back in office. Companies that have plans to expand in three or four years & see an advantage in the accelerated write offs mentioned may move their expansion forward to 2011 or 2012. BO can spin the results either way to suit his purposes. - The 2% cut in employee Social Security payroll taxes for the next year is more tinkering around the edges of our cumbersome tax code that gives no incentive to hire because it does not reduce employers' costs one cent. BO wants to punish the successful no matter what the economic damage - the answer to this point is right before your eyes - the FairTax eliminates all payroll taxes forever. "When we first heard word that President Obama had caved on extending the Bush tax cuts, conservatives and tea party supporters were excited. But now, upon closer review, it seems like we may have been sold a pig in a poke. In the midterm elections Republicans campaigned on restoring fiscal restraint to the budget process, but it turns out that we have a deal that extends unemployment benefits for 13 additional months, which adds $56 billion to the deficit. Also, today we learned that the tax deal is being larded up with all this special interest tax break stuff like 'mine rescue teen training credit,' 'Indian employment tax credit,' 'railroad track maintenance tax credit,' 'the American Samoa economic development tax credit,' (& throw in a '$6 billion subsidy for ethanol'). Is this what we all voted for on November 2nd? Senator Jim DeMint is right: If Republicans don't include spending cuts in this bill, they could risk losing the credibility they've worked so desperately to restore. They have to begin unveiling serious and credible ideas about how they're going to shrink the size and scope of the federal government. Otherwise, Obama will box them into minority status again." And that is why BO will win re-election in 2012. For now have a "happy holiday"
If Doug promises you goodies, unemployment checks for years, tax the wealthy, pay very low taxes from you income, buy a home with 1% down, etc - he wins by a landslide. Public does not want to know where the money is coming from to pay for these goodies. I might be mistaken, but in 2-4 years time, no country will want to own U S dollar, as it keeps declining over time (with few spurts up in value). Now, we owe so much money, nobody wants to say how we will repay it. Maybe Doug has the money to pay for those debts, I don't.